Someone used to use that as their signature here. I think it was Kerry. Another Kahlil Gibran was my neighbor. "The Prophet" Kahlil Gibran died in 1931. His cousin, and godson, with the same name, was my neighbor for 15 years in Boston. He was a neighborhood treasure, a sculptor, and a friend. He died last year at 85. Sculptor and painter, inventor and writer, Kahlil Gibran nourished creativity since he was old enough to mold clay with his hands, sometimes selling for pennies the tiny animals he fashioned while sitting on a curb in the South End when he was only 4. "I believe talent is a grace," he told the Globe in 1967. "You don't deny it, you don't affirm it. But if you don't work at it, you can lose it. The only sin is in squandering talent." Internationally honored for his work, Mr. Gibran was at home in many disciplines. From Copley Square to the South End and Jamaica Plain, his outdoor sculptures trace a map of Boston's neighborhoods. A tripod he designed is part of the permanent collection at the Museum of Modern Art in New York City. 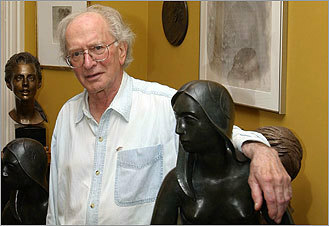 His paintings, drawings, and sculptures are in galleries, museums, and private collections across the country. And with his wife he penned a biography of his cousin, the poet Kahlil Gibran, who wrote "The Prophet" and for whom Mr. Gibran was named. Robust and active until his final hours, Mr. Gibran died early Sunday in Massachusetts General Hospital of heart failure, not long after going to the emergency room because he was feeling ill. He was 85 and had lived in the South End most of his life. A restless imagination drew Mr. Gibran to many facets of the fine arts and took him down avenues some artists might shun. He restored musical instruments and for his own photography once designed and built a 600mm lens. A childhood bereft of money had turned him to a life of invention. "He was a spellbinder," Jean English Gibran said of her husband, speaking from their home in the South End. "This house has his signature on it. He made everything: He made the table where we sat, the desk where I work. He was a welder and made our saltshaker. When he was young, he didn't have a penny. If he saw something that he loved, he'd make it." Concentrating on painting in his 20s, Mr. Gibran spent time in Provincetown, where he opened a boutique with his first wife, Eleanor Mott Berg, who now lives in Sweden. By the early 1950s, he set aside painting for sculpture. "My marriage was breaking up, due to me," he told the Globe in 1967. "I had too much energy. Painting made me restless, didn't demand enough of me. After the divorce, psychiatry made me understand I had to sculpt. Now, at night, after a day of sculpting, I am genuinely exhausted." And though sculpture earned him a place in the world of art, his name remained both blessing and curse. "He said that all his life," his wife said. Mr. Gibran was a godson to the poet and philosopher who wrote "The Prophet," which has sold millions of copies in the United States alone, turning him by some accounts into the third best-selling poet ever, behind Shakespeare and Lao-tzu. In 1974, Mr. Gibran and his wife published "Kahlil Gibran, His Life and World," a biography they hoped would turn the myth back into a man. "Kahlil and I worked for many years excavating and trying to analyze," Jean Gibran said. "He wanted to portray Gibran to the best of his ability, and we wrote the truth about him. I think it was the first very honest portrait of Gibran printed." In a review, Globe critic Robert Taylor called it a "splendid biography" and "an extremely well-written book." In addition to his wife and former wife, Mr. Gibran leaves a daughter, Nicole of Seattle; a son, Timothy of Stockholm; two sisters, Suzanne Huggin and Selma Vassall, both of San Diego; two grandsons; and a granddaughter. A funeral Mass will be said at 10:30 a.m. on Tuesday in Our Lady of the Cedars of Lebanon Church in Jamaica Plain. Burial will be private. Thanks for sharing Paul! How fascinating that you knew Gibran (the sculptor) personally. I thought of you the other day when I researched the poet Gibran because he lived the greatest part of his life in Boston and there's also a memorial for him in Boston. What multi-talented people both Kahlil Gibrans were. Just like Heath. The universe goes in circles. BTW, I ordered The Prophet on Amazon. What I read online made me curious. Bale was left stunned after Ledger, who played the villainous Joker to his Batman in the 2008 blockbuster, died from an accidental prescription drug overdose in January 2008. But he chose to block out all reports about his friend's tragic passing - because he didn't want to hear uninformed outsiders speculate about Ledger's death. He tells Esquire magazine, "I paid no attention to it. I knew him, I knew the family and why the hell would I sit there listening to idiots who don't know anything at all? I literally didn't read anything, didn't watch anything (after he died). "If I happened to be watching anything that came on, I switched over straight away. It's incredible the way the voyeuristic outlook is accepted as news." And Bale still mourns Ledger's untimely death - because the Australian star was one of the few actors whose intensity and passion matched his own on set. "It felt like we were really pushing each other on, to the limits of where you can go with it. He was a good guy. There's not a lot of actors who I stay in touch with. But Heath was one of them." That is not only very poignant but very apt. I don't think fame really changed Heath that much. It was those around who did the changing. I will never feel that Heath was particularly comfortable with all the attention. The more he was thrust into the limelight the more like a deer caught in the headlights he looked. I am sure that is why he chose to live where he did and also why he loved working with the Masses. He could come and go incognito. I always thought one of the saddest things I read about him, was when the Australian press attacked him and Michelle at a premier and when he got home, allegedly rang his dad in tears and put his house on the market the next day. How sad to be driven out of your birth country.